"Most reviewers agree that their pets love the taste! What more could you ask for from a dog toothpaste?" "Many people say it’s made a big difference in the cleanliness of their dog’s teeth, reducing tartar build-up and leaving their breath smelling better." "The toothpaste comes in four different flavors—chicken, vanilla-ginger, beef, and beef with a mint scent." "You’ll be freshening your dog’s breath, reducing tartar, and maintaining healthy teeth and gums." "This product will leave your pet with fresh breath and healthier gums—win-win!" "The Ark Naturals chews are designed with abrasive ridged edges that clean your dog’s teeth as they chew." "The brushes in this kit are specially designed for small, extra small, and even toy breeds." One of the top-rated dog toothpastes available today is the Virbac C.E.T. Enzymatic Toothpaste, which is budget friendly and comes in a variety of dog-friendly flavors. This product comes in a 2.5-ounce tube, and you can choose between beef, malt, poultry, seafood, and vanilla mint flavors, so your pet is guaranteed to love the taste. The C.E.T. Enzymatic Toothpaste can be used on both dogs and cats, and its ingredients are naturally antibacterial to keep your pet’s mouth clean. Further, this product is designed to prevent plaque build-up, which can lead to bad breath, periodontal disease, and more. The majority of dog toothpastes are enzymatic, meaning they contain an antibacterial enzyme that generates hydrogen peroxide to fight plaque and tartar in the mouth. Plus, unlike human toothpaste, enzymatic products don’t need to be rinsed out — your pet can safely swallow them! One of the best enzymatic toothpastes you can buy is the Petrodex Enzymatic Toothpaste Dog Poultry Flavor. This product comes in generous 6.2-ounce tubes and has a tasty poultry flavor that pets love. The enzymatic toothpaste is formulated to control plaque and fight bad breath, promoting oral health in your pooch. The Petrodex Enzymatic Toothpaste is another top-rated dog toothpaste — check out its more than 2,000 5-star reviews!—thanks to its dog-friendly taste and impressive results. Many people say it’s made a big difference in the cleanliness of their dog’s teeth, reducing tartar build-up and leaving their breath smelling better. Plus, happy pet parents say their dogs can’t get enough of the taste and even look forward to their daily brushing! 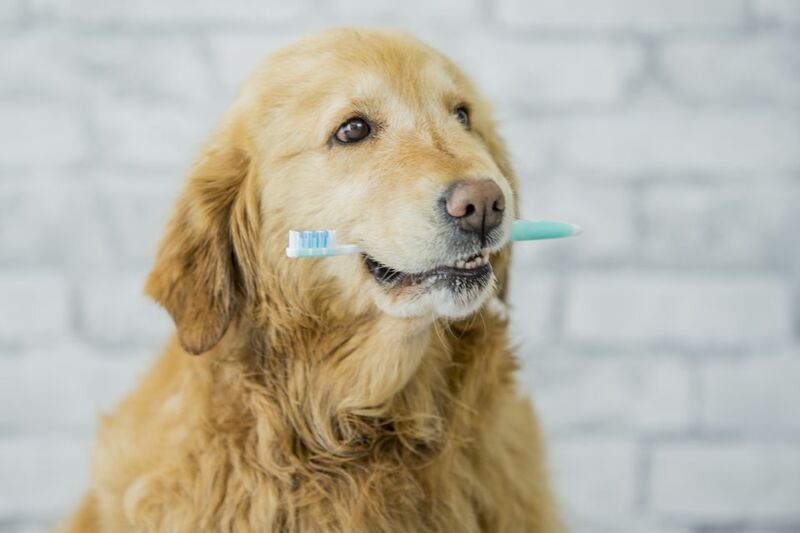 You can easily brush your dog’s teeth using your finger, but some people prefer to use a doggie toothbrush — not unlike the product you use on your own teeth. If you’re looking for a dog toothpaste and brush that will help fight your dog’s stinky breath, you should consider the Arm & Hammer Advanced Care Fresh Breath Toothpaste & Brush Set. With this product, you get a 2.5-ounce tube of toothpaste, a double-ended toothbrush, and a finger toothbrush. The toothpaste comes in four different flavors — chicken, vanilla-ginger, beef, and beef with a mint scent — allowing you to pick the option that your dog will like best. The product is designed to eliminate bad breath while fighting tartar, making kisses from your dog a much more enjoyable experience. Reviewers say they quickly saw a visible difference in the cleanliness of their dogs’ teeth after using this product. Many write it reduced the tartar and gum inflammation in their dog’s mouth, all while making their breath fresher. Just like your dentist may lecture you about letting tartar gather on your teeth, this build-up can be detrimental to dogs, as well. If you want to reduce existing tartar in your dog’s mouth and prevent future build-up, you may want to look into a product like the Well & Good Tartar Control Toothpaste for Dogs. This product comes in a 3.25-ounce bottle, and dogs will love the peanut butter flavor. When you use the Tartar Control Toothpaste regularly, you’ll be freshening your dog’s breath, reducing tartar, and maintaining healthy teeth and gums. Plus, it’s safe for pets to swallow, so you don’t need to worry about rinsing after. The reviews for the Well & Good Tartar Control Toothpaste are incredibly positive. Many people write that it’s easy to use and a lower price than comparable products. The bottom line is if you’re looking to combat tartar on a budget, this is the product for you! Periodontal disease in dogs is a serious condition that results from bacterial infections in the mouth. If untreated, this condition can lead to bone or tooth loss, leaving your dog in chronic pain. However, preventing periodontal disease in dogs is as easy as brushing their teeth on a regular basis. With a product like the Nylabone Advanced Oral Care Natural Peanut Flavored Dog Toothpaste, you can prevent bacteria build-up in your dog’s mouth, ensuring they live a long happy, healthy live. This dog toothpaste from Nylabone comes in 2.5-ounce tubes and has a delicious peanut butter flavor. It’s made with Denta-C, which is proven to reduce plaque that can harbor unhealthy bacteria. Additionally, this product will leave your pet with fresh breath and healthier gums—win-win! Not to mention this dog toothpaste is one of the lowest in price. According to reviewers, dogs love the peanut butter flavor of this toothpaste and think of it as a treat! Plus, many say their dogs’ teeth are cleaner and healthier after using this product. While most dogs don’t mind having their teeth brushed — especially with a tasty toothpaste — there are inevitably some animals that just don’t want you near their mouths. If your pup is fussy about having his teeth cleaned, a better option might be a brushless toothpaste like the Ark Naturals Breath-Less Brushless Toothpaste Dog Chews. These dog chews come in an 18-ounce bag and boast all the same benefits as regular dog toothpaste. The Ark Naturals chews are designed with abrasive ridged edges that clean your dog’s teeth as they chew, and they contain cinnamon, vanilla, and clove to reduce bacteria in the mouth and promote fresh breath. Plus, the patented toothpaste center fights plaque and tartar to keep your pup’s teeth sparkling clean. The Ark Naturals Breath-Less Brushless Toothpaste Chews are designed for dogs 12 weeks and older, and these particular chews are for medium to large breed dogs. Reviewers say these are great for improving bad breath and a lifesaver if your dog doesn’t like having their teeth brushed. Looking for a dog toothpaste that’s perfect for your Yorkie or other small breeds? Then you need the TropiClean Fresh Breath Oral Care Toothbrush Kit, which is specially designed for small dogs. Reviewers say that this doggie dental kit is a great price and the TripleFlex brush is a unique concept. According to reviews, the toothpaste is effective at keeping tartar and plaque at bay, but a few people do mention that their dogs aren’t particularly fond of the mint flavor.